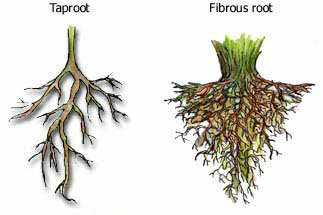 Different types of roots + what is the difference between bulbs, corms, tubers and rhizomes. Absorption of water and nutrients through the root hairs. Anchoring the plant into the soil to support it. Storage of food and nutrients. Synthesis of specific components (nicotine). 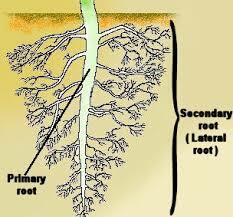 Primary root, not dominant, the whole root is a system of fibres and branches. Primary root with lateral roots (Geranium). Runners or Stolons (Strawberry) - Stolons are horizontal stems that run above ground and produce new clone plants spaced at various intervals. True Bulbs - Daffodil, Tulips, Hyacinth, Snowdrop. Lily. Most have a papery skin (tunic) on the outside, to prevent the bulb from drying out. Lilies do not have a papery skin and therefore dry out faster and are more easily bruised. They are more or less rounded and narrow to a point on the top. They have a flat part called a basal plate at the bottom. The roots grow from the basal plate as well as the shoots and scales. 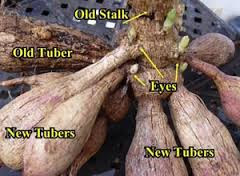 True bulbs have new bulbs (offsets which form from the basal plate). They are made up of rings called 'scales', which are modified leaves that store food. True bulbs add rings each year from the inside, outside rings are used up. Dry situation: In a dry place, or in drought conditions, daffodils may die down prematurely. After flowering, growth should normally continue for several weeks, allowing food reserves in the bulb to be replenished before the following season's flower buds are formed. If growth stops prematurely the bulb may, due to lack of food reserves, fail to form a flower bud. Defoliation: Leaves removed soon after flowering by mowing or when tidying up the garden can lead to blindness. As with dryness it prevents the bulb building up food reserves for the future. 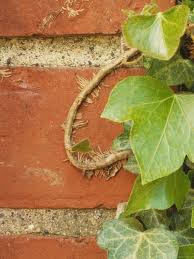 Knotting: Gardeners often tidy up clumps of daffodils after flowering by drawing the leaves together into a knot. This is not recommended as it reduces their ability to function and may cause or increase the risk of blindness. Seeding: Allowing seed capsules to form after flowering means that energy is diverted from the process of bulb rebuilding. Nutrition: Good quality and newly purchased bulbs will normally flower well in their first year on any kind of soil, but in poorer light soils performance may rapidly decline without some additional nutrition. 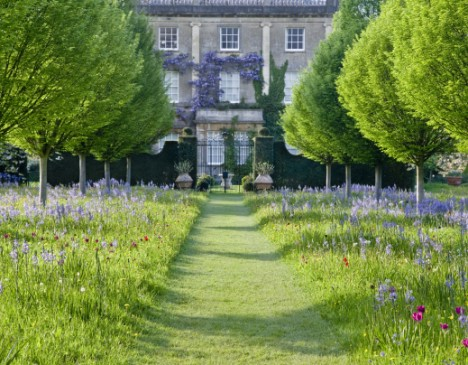 Planting depth: Shallow planting encourages bulbs to divide, producing lots of bulbs too small to flower. Plant bulbs 2 to 4 x their depth. Planting time: Bulb performance can rapidly decline if bulbs are planted later than mid-September. Overcrowding: After a few years, clumps of daffodils may become overcrowded leading to poor flowering. Pests: Narcissus bulb fly and narcissus eelworm may damage bulbs leading to poor flowering. Corms - Crocosmia, Gladioli, Freesia, Crocus. 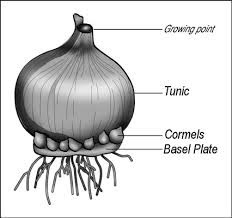 Corms have a papery skin (tunic) and a basal plate at the bottom and 1 or more growing points at the top. They are uniform from the inside and do not have rings. Corms are stem tissue, modified and developed to store food. 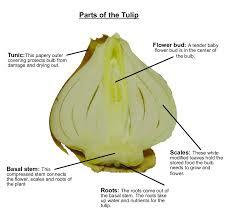 They are used up for growing the flower before it withers away and has formed 1 or more new corms. The new corm contains the food reserve for the dormant crocus. Tubers - Potatoes, Tuberous Begonia, Cyclamen, Anemones. 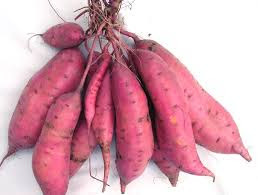 Tubers have no papery skin (tunic). They have not basal plate, most root from the bottom. They have several growing points called 'eyes'. 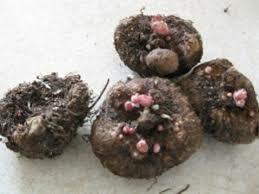 With some tubers like Anemones it is difficult to find the growing points. With them it is best to plant them sideways. Tuberous roots - Dahlias, Daylilies, Sweet potatoes. 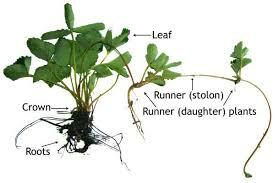 They are modified, enlarged, specialised roots that store food. They are used up during the growing season to be replaced by new storage units. They cluster together, joined to the bottom of a stem. The stem contains the new growing point for the next year - a piece of root alone won't grow. Rhizomes - Iris, Lily of the Valley, Canna, Ginger. Rhizomes branch out and each new portion develops roots and a shoot of itw own. 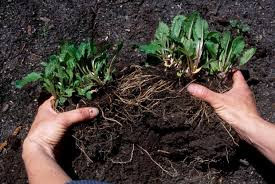 Lots of perennial plants can be divided, however the plant should have a root ball, plants that spread from a central crown and have a clumping growth habit. 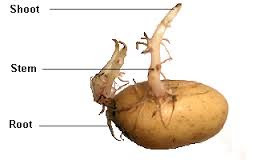 Plants with a taproot are propagated through cuttings and seeds. 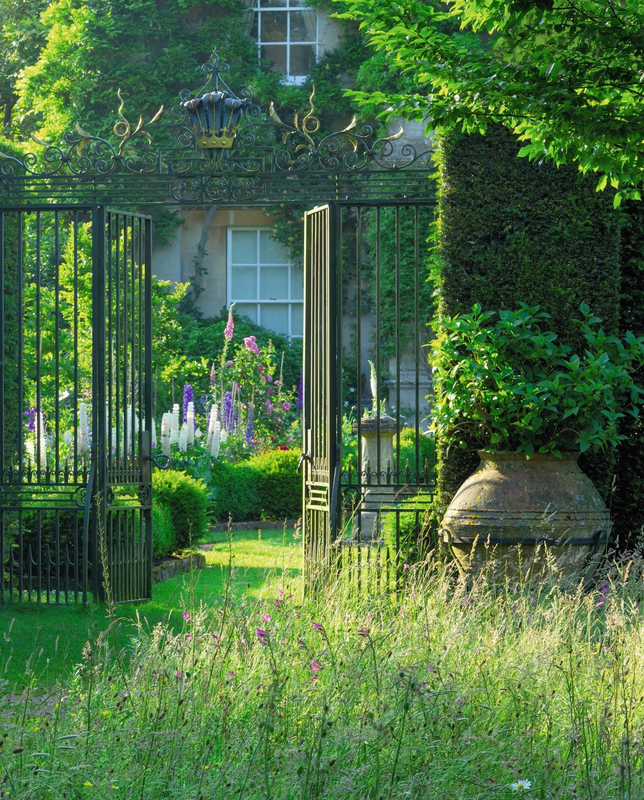 Plants are divided in early spring or autumn, normally spring and summer flowering plants are divided in autumn and the others are divided in spring. After some years a perennial start showing signes of aging. The central part of the clump is not longer producing flowers. Dig up the entire clump carefully so not to damage the roots. Shake off the excess soil. 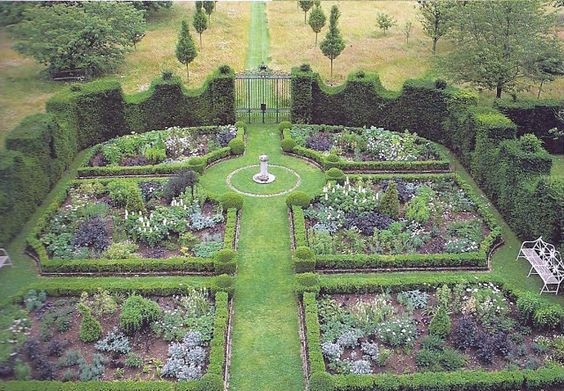 Separate the plant by chopping through the crown with a spade. Divide the plant into smaller pieces by hand, retaining only the healthy sections and discard the old centre bit. 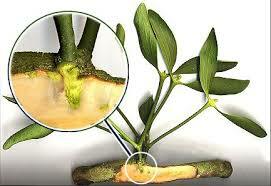 Trim the top, make sure the root section is larger than the top of the plant. 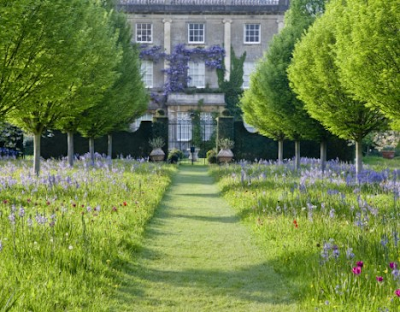 Take the opportunity if you want to replant the perennial in the same spot by cleaning and fertilising the area before replanting or plant them out in a different spot. When a plant is difficult to separate, for instance with fibrous roots, use two forks, back-to-back and tear the plant apart. With plant like Agapanthus or Hosta, cut the plant with a spade into sections, may sure that each section has a shoot or eye. 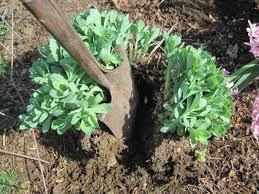 Lift the plant with a fork, making sure you enter the fork into the earth well away from the rhizomes to avoid damaging them. 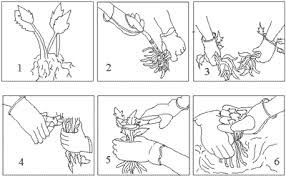 Shake the plant to remove excess soil, split into managing pieces by hand. 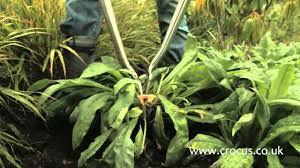 Discard the old rhizomes and cut the rest into small new clumps making sure they have roots and a shoot or eye. Trim off the old, excess root. 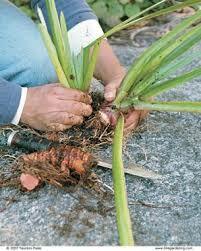 Trim of long shoots and with an Iris cut the leaves into a mitre shape about 15 cm tall.Plant the rhizomes 15 cm apart. 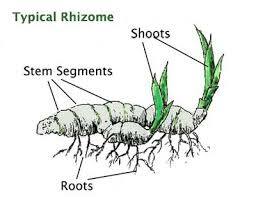 The rhizomes should be half buried, with their leaves and buds upright. Firm in and water well. 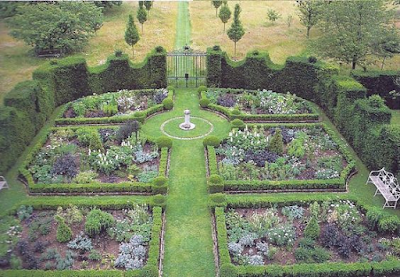 Bibliography: RHS Encyclopedia of Gardening; Website - Gardening Know How, Dividing Plants; National Gardening Association - What are bulbs, corms, tubers and rhizomes. Categories : bulbs, corms, Roots, tubers and rhizomes. How to divide perennials.